When Frank Woolworth launched his 5 & 10¢ empire in 1879 it was an ultra low-cost operation. With the exception of store openings, advertising was a luxury he couldn't afford. For its first fifty years the stores had to rely on elaborate window displays, combined with word-of-mouth, to encourage people to visit. But, facing new challenges in the late 1920s, Executives had to think again. Before long they had established the brand as a major advertiser, using print media, catalogues and later radio and television to spread its values to the shopping public. This page celebrates the store's inimitable marketing with our very own Woolworths Alphabet. Advertising saved Woolworths more than once and is still fondly remembered by many people. Its television campaigns came to mark the arrival of the festive season. Its ads were so long, there was plenty of time to boil the kettle and make a brew before your favourite show returned. But Woolworths rarely hit the screen until the mid-1970s, twenty years after ITV was launched. Imagine - no "Wonder", no "Well Worth It" and no "Let's have some fun". Catalogues and newsprint were the preferred media from 1931 (when the company asserted its independence from the Americans as it launched on the Stock Exchange). They formed a pivotal part of the store chain's advertising until the final day, though the chain's Big Red Book 2008 was intended to be the last. Until the mid 1920s, with only two exceptions the company only advertised new store openings - nothing else - on instructions from Mr. F. W. Woolworth. with big leaders with prices attached"
Don't imagine that the Founder didn't like advertising - he never skimped on handbills or press advertising for store openings. Quite simply in the early days he didn't have to advertise once a store was open. 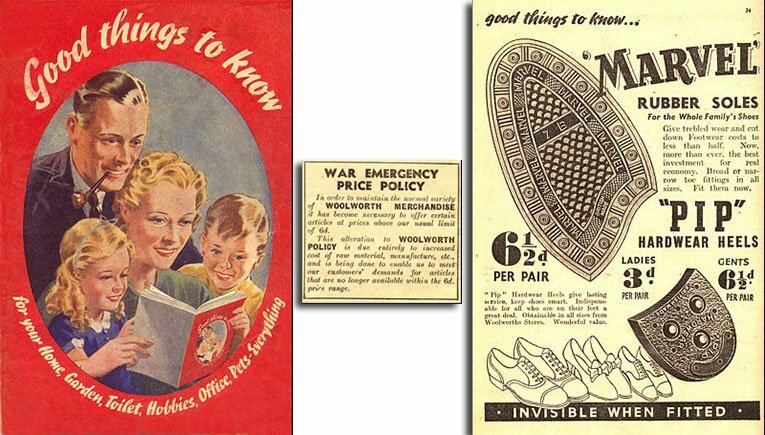 Woolworth goods were so much cheaper and better than the competition that word of mouth was enough. If a rival store began to threaten, the firm could afford to drop its prices until they gave up. Every store opening from 1879 until 2008 was supported by advertising - in fact one opened at Bitterne, Southampton only a fortnight before the British Woolworths crashed into Administration. 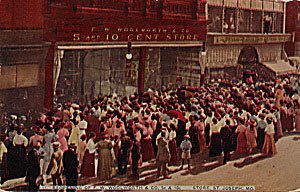 Like the first store in Lancaster, Pennsylvania, the Woolworths Big W openings in Aberdeen and Swansea were supported by handbills delivered door-to door. Most openings were also press or radio advertised, with a few advertised on television or by billboard trucks or buses around town. Fun was always in abundance for openings. 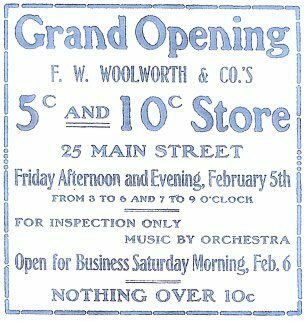 Frank Woolworth arranged an orchestra and a string quartet for store openings - and more recently a brass band and a stilt walker were among the many attractions. 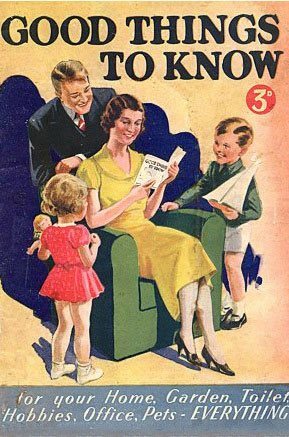 GOOD THINGS TO KNOW magazine was the first sustained attempt at advertising in the UK when it appeared in late 1938. The small magazine was sold to customers for 3d (about 1¼p). The booklet contained tips for "Hobbies, Home, Pets, Toilet ... everything! ". It encouraged customers to trade up. It was interwoven with ads for the products of the day - all funded by the suppliers. It was a hit! Home adornment featured strongly in "Good Things To Know", with design ideas for every room in the home. Suppliers found that, by using the pages of the magazine they could illustrate how to use their products alongside an advertisement, all serving to boost sales. Room settings and 'how to' guides continued to feature in the store chain's catalogues and advertising right through to the final Big Red Book in Winter 2008/9. 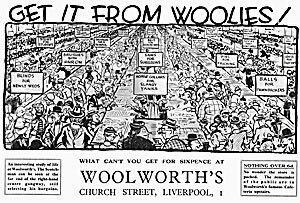 In honour of their favourite store, in 1935 students from Liverpool University included a spoof ad in the centre spread of their Rag Mag headed "GET IT FROM WOOLIES! ", and with the slogan "What can't you get for sixpence at WOOLWORTH'S CHURCH STREET, LIVERPOOL, 1"
January and July were sale months at Woolworths stores every year frome 1880 to the 'biggest ever £50m clearout' in July 2008, always supported by strong window point of sale and unbeatable deals across the store. 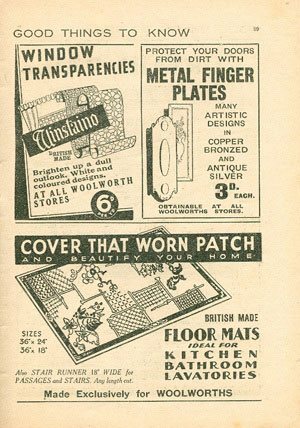 In the 1930s, suppliers competed for window space, wooing window dressers with elaborate display materials and design ideas - proving Frank Woolworth's adage about the windows as shown under the letter 'D' on this page. It is simply amazing what they achieved with the simplest materials - paper signs, bandanas and mirrors. Keeping prices down to the upper limit of sixpence (2½p) was the major pre-occupation of the Buyers throughout the 1930s. In America, faced with intense competition, F. W. Woolworth Co had introduced a 15cent (9d or 4¼p) line in 1932, before dropping the upper limit altogether in 1935. In the UK ruses were used to maintain the limit until the outbreak of World War II. The longer they kept the prices down, the more successful they became. Finally in 1940 the Buyers gave in to the inevitable and announced that the limit had been suspended in 1940's Good Things To Know. Letting people know where to find Woolies was the key priority during the 1940s as store after store was damaged in the Blitz. The firm's defiant slogan was 'we never close', and the Directors were very proud of the way that their staff found ways of re-opening when the worst happened. For example, weeks after the superstore in Plymouth was destroyed by enemy action, a large temporary branch opened in the City's market. Market changes in the 1950s encouraged post-war Woolies bosses to make radical changes to the chain's brand-positioning, marketing and public relations. Despite the austerity and rationing of the late Forties, customers were determined to "win the peace", demanding higher standards of living, more comfort and convenience and seeking out modern designs for their homes. For F. W. Woolworth, no longer constrained by an upper price limit and with a strong base of domestic and international suppliers, this presented a big opportunity. The firm reinvented itself, pioneering the concept of 'Do It Yourself' and offering stylish designs for the home, kitchen and garden. Underpinning this was a highly effective advertising campaign. New ranges and new stores were the hallmarks of Woolworths throughout the 1950s. During the decade the chain grew by 220 outlets, while in parallel many existing City Centre outlets were doubled or trebled in size. Woolworth shares topped the London Stock Exchange, standing second only to the giant ICI Corporation, a chemicals and pharmaceuticals conglommerate. The High Street store's advertising became bigger and bolder. Like other retailers of the era, it developed a number of own-brand labels. These included 'Household' and later 'Cover Plus' for paint and polish, 'Beacon' for homewares and Dinah Marsh for fashion accessories, while in 1964 most gave way for a single pervasive low entry price point brand, 'Winfield', which endured until 1982. For a spell in the early Sixties food was sold under the Kingsmere brand name, bizarrely named, it is said, after Frank Woolworth's favourite pet bulldog from the 1910s! E. R. Holloway's Baby Doll cosmetics became an exclusive smash hit of the late Sixties. Organs were the unlikely candidate for the first Woolworths television commercial of modern times in 1975/6. Company records show that the idea of advertising on television was very controversial in the boardroom. The firm only appointed a Marketing Director for the first time in 1970, and the incumbent, the long-serving Mike (L. B.) Sherlock, hired Rod Allen and Peter Marsh of the late and lamented Advertising Agency Allen, Brady and Marsh to shape up a campaign of television commercials. They persuaded sceptics on the Board who argued that the expense couldn't be justified and no-one would remember the slogan 'That's the wonder of Woolworth' that they should give it a go. As fate with have it, the unknown young star of the first commercial in the series, who appeared alongside the much-loved Crackerjack presenter Leslie Crowther, got in touch with the Woolworths Museum, asking for a copy of the advert to show to her children. We were pleased to oblige and through the pages of the Museum are pleased to introduce Nicola Greenwood - superstar (below left). The commercial was a big hit. 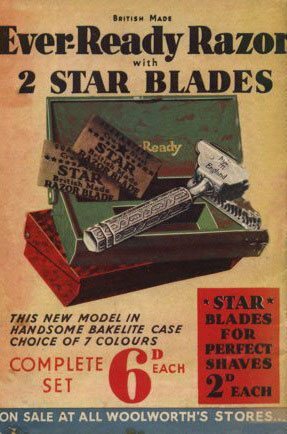 Sherlock (who had served the firm for over forty years, rising from the stockroom to the boardroom, managing stores in-between), had captured the brand and personality perfectly - presenting Woolworth as aspirational and fun, with innovative products at good value prices. Organs, for example, were simple to play, suitable for everyone and at Woolworth prices were affordable too. All five of the Company's core values of latter years - product obsession, pride, innovation and simplicity in stores open for all were summarised in just 30 seconds! The commercials are still remembered by press and public alike. There were many ads in the Wonder series, featuring (among others) Noel Edmonds, Sir Jimmy Young, Georgie Fame, Tony Blackburn, the Nolans, Henry Cooper, Barry Sheen and Gerald Harper. The campaign proved highly effective in attracting new shoppers to the stores, particularly at Christmas. Public Relations is an essential part of any advertising strategy, and F.W. Woolworth's British and North American teams were widely acknowledged to be among the best in the industry. The Founder courted journalists in the 1910s before embarking on his skyscraping Woolworth Building in Manhattan. It was the tallest in the world from 1912 until 1929, when it was overtaken by the Chrysler Building and then the Empire State Building. Even in the 21st Century the British PR team boxed above their weight, securing hundreds of column inches of editorial about the Christmas ranges. City Editors developed a soft-spot for the 'hard-pressed' CEO, giving him an easy ride even when results were poor. This made the sudden collapse in the credit crunch, just a few days after a change at the top, all the more shocking for most shoppers. Queen Elizabeth II has inspired the United Kingdom for over sixty years. 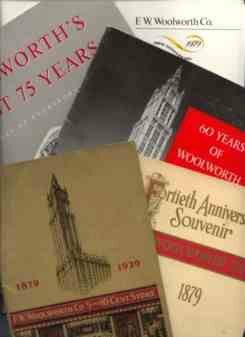 Woolworth was proud to play a part at the start of her reign, as the source for countless souvenirs. The stores sold bunting and everything that Britain needed for party. The chain remained loyal supporters into the twenty-first century. Her Majesty once told the Daily Mail that she had done her Christmas shopping at Woolworths. She had been spotted in the large branch in Peascod Street, a few steps from Windsor Castle. By 2002, with a new team at the helm, the golden jubilee efforts were more muted. In 2003 red-faced executives had to apologise after putting out a silly PR story claiming that suppliers were preparing royal wedding souvenirs for the nuptuals of Prince William and Kate Middleton. With hindsight the retailer did better at predicting the future King's bride (which was announced seven years later on 16 November 2010) than its own demise, vanishing from the High Street in January 2009. Radio played an important part in Woolworths' marketing strategy from the early days. The firm's early gramophone records included some of the light entertainment programme output of BBC Radio, with Philip Ridgeway's Parade featuring particularly strongly. In the USA the company espoused broadcasters from the early days of commercial broadcasting, sponsoring The Woolworth Hour on CBS Radio from the early 1950s and securing a large, regular audience. The British Company toyed with advertisements on Radio Caroline, before starting a love affair with Independent Local Radio with advertisements on the first stations, London's LBC Radio, and Capital Radio and Liverpool's 194 Radio City, and continuing to place ads at sale time and for openings. 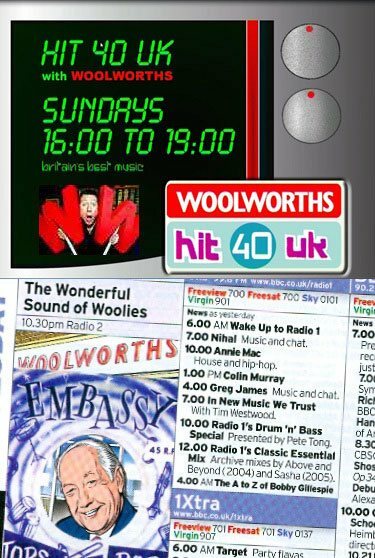 In 2003 Woolworths Group asserted its dominant market share of music and video wholesale and retail, by sponsoring the popular chart show Hit40UK, which was carried by 96 stations across the UK and was presented by Neil Fox. Matthew: "The last word goes to Woolies historian Paul Seaton"
Seaton: "...and that's why I am proud to work for Woolworths in their hundredth year"
Matthew: "That interview was recorded before the sad news that Woolworths had gone into Administration." 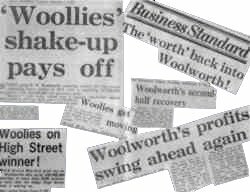 The following morning the programme received five star reviews in the press, with The Guardian noting that if nostalgia could save a brand, on the basis of the broadcast Woolworths should have been opening stores rather than closing them. Stars galore featured in Woolworths commercials over the chain's final third of a century in the High Street. Many made cameo appearances in a style of 'spectacular' Christmas advertising that has since been adopted as a house style by other retailers. The adverts of the 1970s were famous not only for their stars but for the sheer duration, often filling the entire commercial break with a choreographed performance or a specially commissioned song performed by a leading performer. See how many of the stars you can recognise in our gallery, before floating the picture with your mouse to reveal the name. Trams were among the more unusual places to feature Woolworths advertising over the years. As well as conventional decal style side banner advertisements, the Wonder of Woolworth tram was a regular feature of the Blackpool illuminations in the 1970s. At the time the chain had three stores in the popular resort, including an iconic superstore on the corner of Promenade and Bank Hey Street. At the same time advertisements for the range of souvenirs and gifts also appeared widely on the London Underground. In recent years trams have started to reappear in the towns and cities of Great Britain. Perhaps one day the High Street stores will make a similar comeback! Up-to-date advertising is a must. In a highly seasonal business Woolworths was keen to be able to choose the products and offers to feature on TV day-by-day according to sales in-store. A major barrier to this used to be the extended approval period for new material, which used to have to be checked against a series of standards prior to broadcast, adding a timelag of a week or more before a commercial could be aired. While part of the Kingfisher Group, Woolworths was able to pioneer a new approach, working with the regulators to agree a fast-path process to get an ad on TV. Using their muscle Kingfisher got ads signed off in outline, with the products and prices dropped into place right up to half an hour before transmission. This gave Woolworths, Comet, B&Q and Superdrug the chance to promote slow-moving products to effect a clearance, to compete against rival chains and, in the case of Woolies, to incorporate surprise hit CDs, films and computer games into the latest TV campaigns. Value was the enduring essence of Woolworths, which sustained the brand for much its hundred years in the British High Street. When the management stuck with it and concentrated on getting decent quality products into the stores at jaw-drop prices, the chain prospered. But when talk changed to 'increasing basis points' (gobledegook for increasing margins), 'targeting a new demographic' (gobledegook for selling more expensive things to the exclusion of cheaper things) and 'focusing on basket size rather than footfall' (selling more to a smaller number of customers) things started to go wrong. 'Nothing over sixpence' saw the chain grow from nothing to dominate British High Streets. Later the value position was re-established in 1964 by the Winfield low entry price point (budget) range, and from 1975 in a series of advertising campaigns, including the 'Wonder of Woolworth' and 'Crackdown'. WorthIt!, which launched in 2005, was the next incarnation. Once again the message attracted new customers. Sales and profit finally started to recover after years of decline. Woolworths' famous 'W' served the store chain as a trademark and emblem in five distinct guises over ninety-nine years in the British High Street. For the first fifty years a 'Diamond W' which had been drawn by the founder, Frank W. Woolworth, appeared on storefronts and product packaging as well as letterheads. 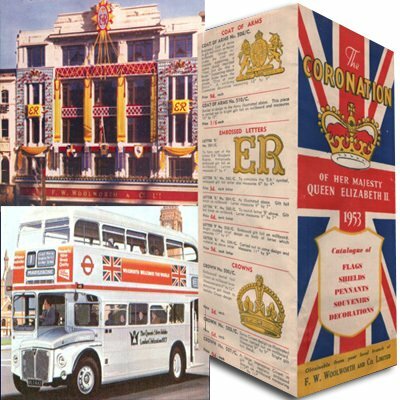 It was replaced by a shopping basket W motif in 1959 as the British chain marked its golden jubilee, and by a more stylised shopping basket version when the chain's Winfield own label was rebranded in 1971. The chain changed hands in 1982, prompting the addition of an 's' on the end of the name. This officially recognised one of the nicknames that shoppers had used for more than seventy years. The new owners also took the opportunity to replace the 'W' with a plain sans-serif design after briefly dabbling with restoring the original diamond W. In 2001 the brand changed hands again. Work on a new identity for Woolworths Group plc spawned a serif on sans-serif motif, which became the final emblem in the British High Street. In 2002 a new house style required lots of 'W' words for promotions and brand communications. This forced copywriters to scrabble for their dictionaries. Wonder, Wonderful, Wonderland and Woolies were used regularly, supplemented by Wow, Wonga, Wizard, Wicked, Where, When, We're, Wish, Whizz, Wild, Win and Word and World. Everyone was relieved when the concept was replaced by the slogan "let's have some fun" the following year. Xmas always marked the high point of the store chain's year. It was the time when everything came together - advertising, point of sale, the product range and customer service that created a unique magic. Even in recent times it is estimated that three-quarters of the nation visited the stores in the final twenty shopping days before the festival. 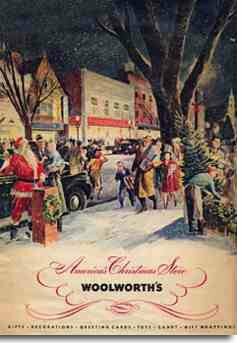 For many years Woolworths in the USA was nicknamed 'America's Christmas Store', and adopted the slogan on carrier bags and product packaging. The Company had a unique claim to fame in that it was Frank Woolworth who pioneered cheap Christmas Decorations in the USA, stocking glass baubles from the very first store in 1879. Sadly for the years 2004 to 2008 'X' also accompanied the chain's annual sales figures, as they declined each year compared with the last under the Kids and Celebrations strategy evangelised by CEO Trevor Bish-Jones. Following the launch of WorthIt! in 2007 it seemed that the chain would move out of negative territory in 2008/9, until the credit crunch undermined the firm's banking arrangements and business model. Year books marking key milestones played a key part in the cultural life of Woolworths around the world. In a tradition started by the Founder, the chain circulated books of photographs internally with mugshots of every senior executive and store manager. The tradition stretched right from 1890 to 2000, with another planned for the centenary. 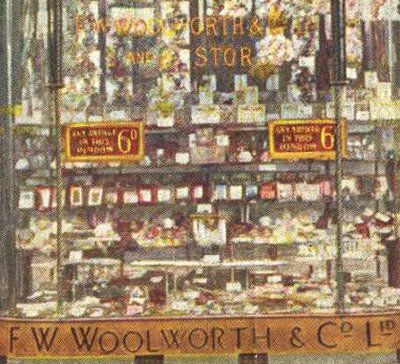 Frank Woolworth also edited a souvenir booklet for customers, telling the firm's story in 1919 with a pamphlet to mark the fortieth anniversary of his first store opening. The tradition was continued by further booklets in 1929, 1939, 1954 and 1979 in the USA, with the subsidiaries adding versions of their own in the UK in 1959 and in Germany in 1969 and 1999. The Woolworths Museum is proud to follow in these footsteps. 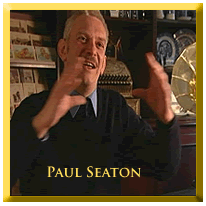 The site author, Paul Seaton, was prpearing a centenary book to accompany the website, when the Company collapsed. He had to make extensive changes before seeing the project through. 'A Sixpenny Romance, celebrating a century of value at Woolworths' (ISBN 9780956382702, 3D and 6D Pictures Ltd) was published on-schedule on the 100th anniversary of the first British opening, 5 November 2009. It remains in print and is available for sale on-line from our gift shop or from Amazon.co.uk. Zero. Sadly the total number of employees working for Woolworths stores in Britain, Ireland, the USA and Canada by 5 November 2009. By this date the British brand had been revived on-line. During the same year the German Woolworths survived administration and has been restored to health. It continues to operate a chain of medium-sized department stores today. Z also stands for Zimbabwe, where, by a quirk of fate, a former British F.W. Woolworth continues to trade from its original store building, now as part the unrelated Woolworths Department Store chain of neighbouring South Africa.